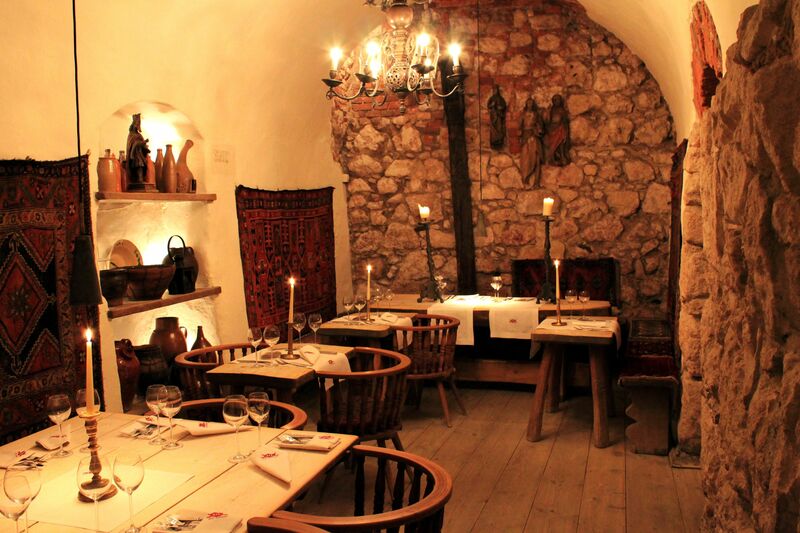 Restaurant Pod Aniolami (Under the Angels) invites for traditional Polish cuisine in a romantic tete-a-tete ambiance of candle-lit medieval cellars or courtyard garden located on Cracow’s famous Royal Tract leading to Wawel. 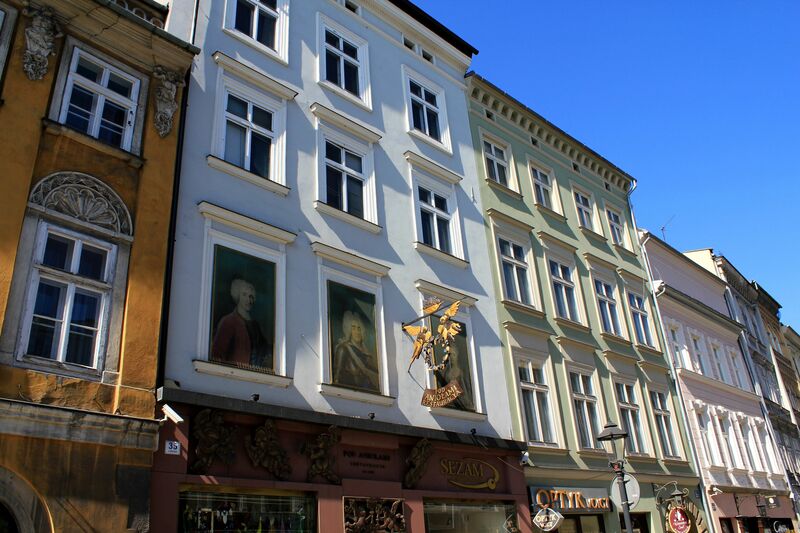 Restaurant “Pod Aniolami” (Under the Angels) is located on one of the most prestigious streets of the old Krakow – Grodzka. Already at the turn of 12th and 13th century, the area of today’s Grodzka street formed part of the Royal Tract leading from the Market Square to the nearby Royal Castle – Wawel at the southern edge of the old city.. Originally known as St. Andrew Street, it gained its shape close to what we can witness today in the first half of the 14th century. Its initial name came from the 11th century Romanesque church dedicated to St. Andrew (located at Grodzka 54, today it is one of the oldest buildings in Cracow). It is not clear how old is building in which today operates the restaurant Pod Aniolami. It is highly possible that gothic cellars remember 13th century when this part of the city was already taking shape and roots. But the “above the ground” building’s structure is certainly younger. Archives date it to 16th century which by all accounts is still a very respectable age. But even more importantly, the building was erected in time of Krakow’s Golden Era so many traces of those prosperous times are still visible. For few centuries the building at Grodzka 35 was used as a workshop by Krakow’s goldsmiths. No wonder, proximity of the Royal Castle frequently visited by members of royal and aristocratic families made this profession literally the ‘golden business”. In early 18th century in this building on numerous occasions Augustyn Howel – the Castellan of His Majesty King of Poland held banquets for his noble guests. It is hard to say that he was the precursor of today’s restaurant Pod Aniolami, but one can say that the he could be well an inspiration. 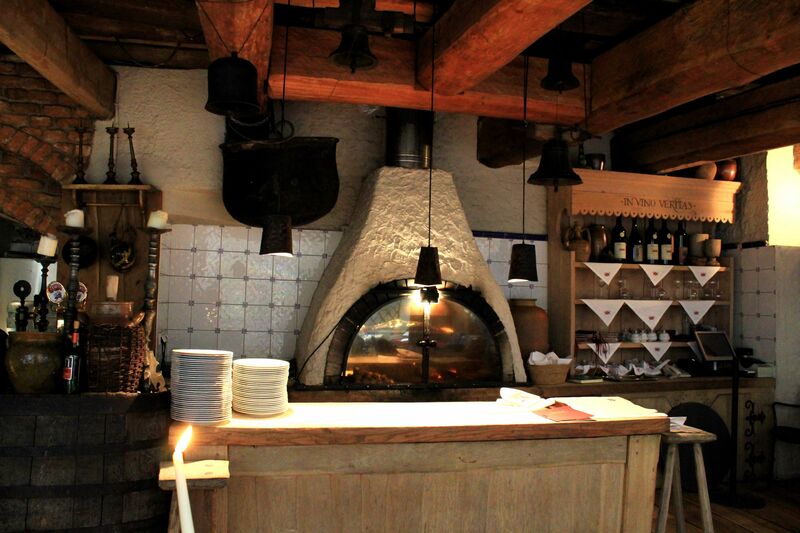 Certainly the atmosphere of these banquets and feasts still vibrates in the cellars of the restaurant Pod Aniolami. The name of the restaurant - “Pod Aniolami” (Under the Angels) apparently reflects the fact that during major pre-opening renovation works two wooden figurines of angels were found in the cellars. That prompted the owner to name the local “Pod Aniolami” probably considering this discovery as a “sign”….. Since then the little gilded cherubim mark the entrance to the building. The rest is the history (or rather a new chapter in the book) beautifully reveling its “pages” to everybody entering these days the restaurant Pod Aniolami. It may be worth to mention that owner – Mr. Jacek Lodzinski is an avid collector of objects of naïve art as well as all kind of artifacts of probably lesser “historical” but great nostalgic value. Many of them you will find generously displayed on the premises, hanging on the walls, standing on the shelves…. The main part of the restaurant is located in underground Gothic cellars neatly adapted for public use under watchful eyes of city’s conservators. On the first floor there is a large banquet room with well preserved 18th century polychrome ornamentation. The courtyard behind the building houses the roofed “Garden” with decoration reasonably matching the medieval character of underground surroundings. On top of flowers dotting the garden, lovely accents of nature come from the small mosaic fountain on the wall and caged-birds singing their lovely songs (when in the “good mood”). Some say that Angels are often coming to cellars (I would not dispute this claim), but certainly the Garden’s part of the “Under the Angels” restaurant is closer to sky (or heavens if you wish). Indeed it is a heavenly place…. The restaurant - laureate of many culinary awards, promotes an Old Polish cuisine representing the best traditions of royal and aristocratic tables. And frankly, almost from the beginning the restaurant scored high notes from the visitors including “gourmets” thanks to delicious meals, romantic ambiance and mysterious medieval atmosphere hanging in the air. The menu includes such delicacies as herbs-marinated meat (wild boar, pig, deer, lamb…) grilled on beech wood-fired stove, variety of shashliks (kind of Shish Kebab), pork’s knuckle, ducks, mountain river’s trout etc. Grilling is an important part of old Polish culinary traditions, no wonder that several wood-fired grills are available for cooking. For sure you will also find here large selection of traditional Polish dumplings (pierogi). Given the fact that restaurant Pod Aniolami has consecutively won top places in Krakow’s Pierogi Competition, certainly even most gourmet customers will find something “angelic” on the plate. An there is customary Polish Red Borsch (beetroot soup), Wild Mushroom (Boletus) Soup to name only few from the long list…. For entre, especially foreigners should try the grilled smoked sheep cheese! The restaurant also offers few vegetarian dishes, although to be truthful, these are new additions to the old recipes because as far as I know the Polish traditional cuisine was created by “carnivorous minds” for similarly oriented stomachs….. 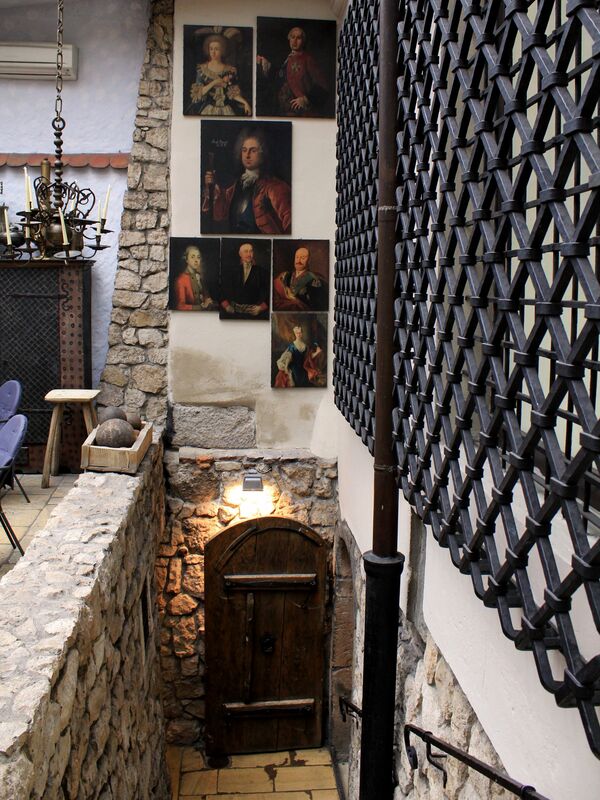 Certainly old traditional Polish cuisine served at the restaurant Pod Aniolami greatly helps visitors to “travel” back in time to Cracow’s golden medieval past…. 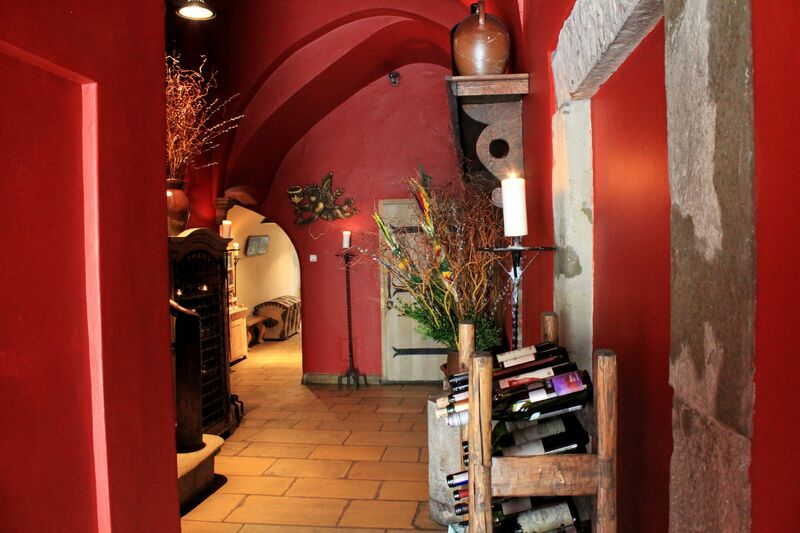 Vaulted, antic-furnished, candle-lit cellars despites their raw stone and brick walls offer overwhelming warmness inviting for a romantic tête-à-tête diner with your loved one(s). And like in the medieval times when Krakow and the Royal Castle have been the “places to be and be seen” for countless dignitaries, princes and nobility (all passing along the Royal Tract of Grodzka Street) nothing really changed much till our days. The quick look into the Guest’s Book proves visits of Presidents, Royal Families, Prime Ministers, Noble Prize Winners and men from the world of culture and art….. But the good news is that unlike in the long forgotten past, these days everybody visiting the restaurant is treated like a king (or sort-of)….. I'm sure that the restaurant "Pod Aniolami" will meet your expectations. However if at any time during your stay in Krakow you would like to try other restaurants, keep in mind that the list of Top Ten Restaurants in Old Krakow has at least nine more renowned candidates :-).